Evan Stone scores four goals for Cougars. 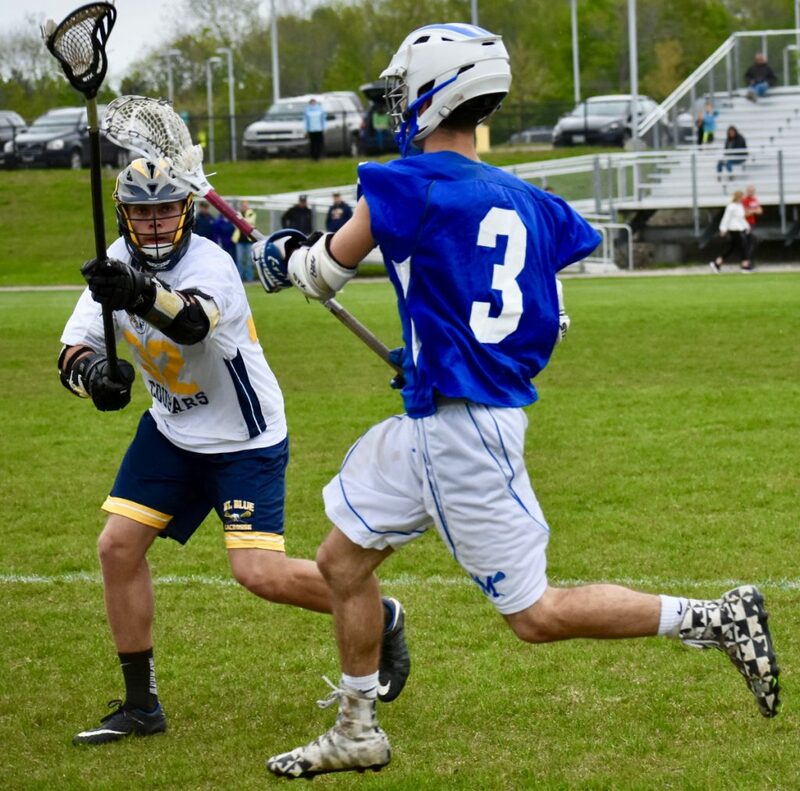 FARMINGTON — Turn around for a second and you just missed the Morse Shipbuilders score another goal in the first half of a boys’ lacrosse game at Caldwell Field on Tuesday afternoon. Morse launched an all-out blitz to build an 8-1 lead in the first quarter and rattled Mt. Blue before eventually marching off with an 18-11 victory over the Cougars (2-8). “It was like a blitzkrieg there,” Mt. Blue coach Kevin Averill said. “Looked at the coaches and was like, ‘What is going to happen here?’ Tried three different things. Used different faceoff guys. The Cougars finally calmed down in the second half and moved to within five goals of the Shipbuilders (6-5), but the damage had already been done. Sheamus Mann had five goals for Morse, while and Spencer Knowles and Jacob Brochu each scored four and Mason Savory turned in two. But what was amazing to watch was Morse’s faceoff king Ethen Pascuzzo win the ball time after time, which allowed the Shipbuilders to go into a fast break that scored a bunch of goals. “We have a history of imploding in the fourth quarter,” Morse coach Jay Paulus said. “All of sudden, they got a little cocky and playing down. It is not that the team wasn’t playing hard … but we tend to drop down when we think we have it. Yeah, that was ugly. “Our FOGO (faceoff guy) is tops in the state. He only lost two (faceoffs) in this game. Evan Stone scored four goals and Keegan Roberts dropped in three for the Cougars.